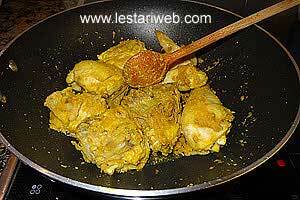 Another variant of Javanese Fried Chicken : Ayam Goreng Bumbu Kuning, one of my family's favourite side dish!! Kuning means yellow. 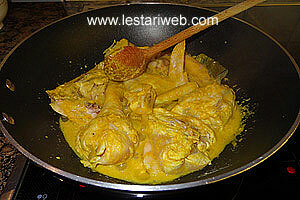 The name already suggest that this dish is dominated by yellow colour which comes from turmeric. 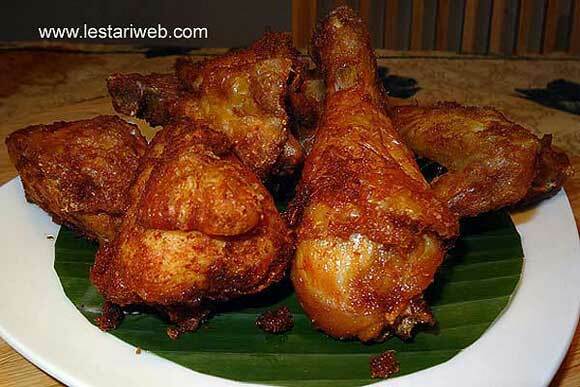 You can find this fried chicken all the way along Java Island. Spice may be varies slightly from region to region but the main ingredient as I mentioned above, turmeric is always present. What about the taste?? Hmmm....it's finger licking good ;-) Crispy & yummy!!. Tipp : Cut the chicken into a smaller serving portions to ensure that the spice mixture is well absorbed & the chicken will be crunchy on the outside. 750 gr/1.5 lb chicken, washed. 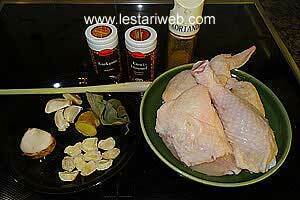 Cut the chicken in serving portions, wash and set aside. Put all ingredients for the paste in a blender or food processor and blend until smooth. (If necessery add a little bit water from the recipe (200 ml) to help the blending process). 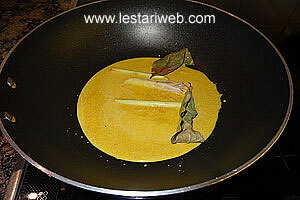 Transfer the paste mixture into a wok or shallowpan. Add the rest of water if any. Add the salam leaves & lemos grass. 4 Add the chicken pieces, stir the paste to coat the chicken pieces over medium heat until the chicken's colour turns to white. 5 Simmer slowly over low heat, stirring all the time until the mixture is absorbed, the chicken becomes tender & well coated with the paste. 8 Adjust the seasoning, add salt if necessary. ( A bit salty is better than it tastes bland after frying). Remove from heat, discard salam leaves & lemon grass. Put aside. 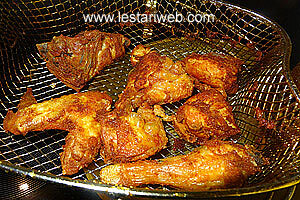 9 Heat enough oil in a frying pan & deep-fry the chicken until crispy-golden brown. Set aside to drain or pat dry with kitchen paper. 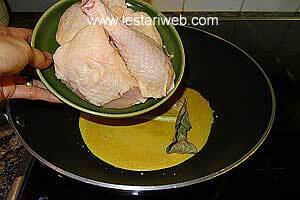 (If preferred deep-fry the chicken in a Fritteuse to 375°F (190°C) for about 4-5 minutes). 10 Serve hot with Tamarind Soup, sambal & raw vegetables.